Ray Perez, a partner in Connell Foley's Public Finance Group, has been named a winner of the Compadre Award by the Latinas United for Political Empowerment PAC (LUPEPAC). Ray will be recognized at the Annual Awards Reception, which will be held on November 1, 2018 at Maize Restaurant in Newark. The Awards Reception honors outstanding leaders who are shaping politics and policy in New Jersey. 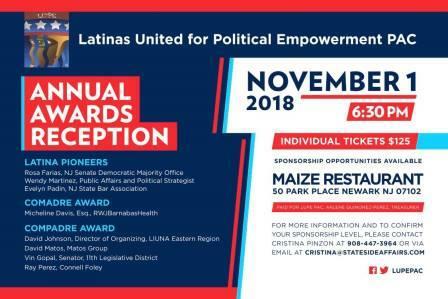 Three different award categories are presented: "Latina Pioneers" (recognizing women who have led the efforts to advance women's leadership at all levels of New Jersey public and private sectors); and "Comadres" and "Compadres," who are leaders with a record of supporting LUPEPAC's mission to increase the number of Latinas in New Jersey elected and non-elected office. This year's honorees include Rosa Farias (NJ Senate Democratic Majority Office); Wendy Martinez (Public Affairs and Political Strategist); Evelyn Padin (NJ State Bar Association); Micheline Davis, Esq. (RWJ Barnabas Health); David Johnson (Director of Organizing, LIUNA Eastern Region); David Matos (Matos Group); Vin Gopal ( Senator, 11th Legislative District); and Ray Perez (Connell Foley).